Soon we will be tapping the first Crafty Cabale, thanks to the good folks at The Wheaty in Adelaide. Ever since they launched The Wheaty Brewing Corps there had been discussion about creating a beer together so we thought we'd enlist the help of our Crafty Cabalistas in making it happen. 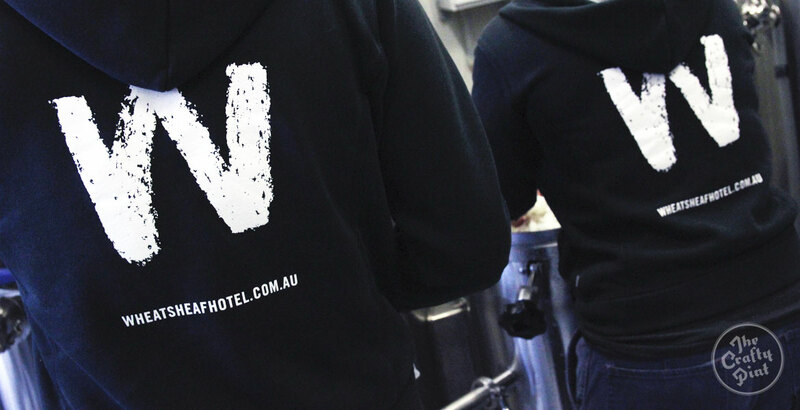 Last Friday, Jade and Dave at The Wheaty patiently guided Tim, Gus, Alex and James through brew day, with all of us getting the chance to help out at all stages – and managing to avoid opening any of the many valves at the wrong time and thus dumping the brew on the floor. You can check out some of the photos from the day here. The beer is a far cry from the last time we brewed a beer commercially – the Auld Bulgin' Boysterous Bicep with Murray's that was created for a past Beervana NZ Media Brew competition (and won). From that smoked, imperial Belgian mussel and oyster stout we headed the other way and have brewed a straightforward English style pale ale, some of which will hopefully make its way into a cask ready for a multi-format tapping when we host a SA Crafty Cabal Launch Party in the coming weeks (details TBC). The name we came up with on the day, after considering many directions, is Landlady, a nod to the classic Timothy Taylor Landlord and a doffing of the Crafty cap to Jade and her awesome crew. Now, a week after sending five Cabalistas and their mates to the Adelaide Beer & BBQ Festival with all-season passes, we have some more winners to announce as well as new goodies for our supporters who've signed up to The Crafty Cabal. The lovely folks at Holgate Brewhouse gave us three cases of their more colourful brews to give away: Road Trip IPA, Hop Tart semi-sour pale ale and Double Trouble Belgian dubbel. The first name out of the hat was Rebecca Waddell, AKA Cabalista CXLIV, who told us she is "no longer the person who never wins anything, I am now the person who is super excited about winning beer!" The new multi-pack prize draw comes from Melbourne newcomers Fury & Son. You'll be able to read about them on the site soon. For now, you can enter the ballot to win a case each of their New World Pilsner, Pale Ale and Scotch Ale brewed by Craig Eulenstein, who last year took out one of the Champion Brewer titles at the Craft Beer Awards. The winner of the latest prize for our favourite Cabal redemption photo adorned with the hashtag #craftycabal goes to Jamie Webb-Smith for an autumnal shot of a filled free Two Birds squealer and a full Crafty Cabal glass. A Black Box of Dark Ales will be on its way shortly. The next funky beer up for grabs for the best photo is a bottle of Two Birds' Chardonnale. Get redeeming, snapping and tagging! The Crafty Pint's founder is set to launch his second beer book, the Great Australian Beer Guide, via Hardie Grant on August 1. We're holding a launch party at Forester's Hall, in Collingwood, on July 31. If you'd like to join us and friends from the beer world, then register for the ballot in your member's area now. We'll invite as many of you as we can fit within capacity. Aside from some new ongoing deals that are set to go live, we're lining up an exclusive pre-opening tour and tasting at Stomping Ground in Melbourne. It's the new venture from the people behind The Local Taphouse and GABS. The tour will be on August 11 and we'll open the ballot next week. Look out too for a ballot to win some amazing VIP packages to the forthcoming Beer InCider festival in Brisbane. Thanks again for your ongoing support in helping us make The Crafty Pint the best goddam beer site we can and build a stronger Australian craft beer community. It's hugely appreciated. Find out more about The Crafty Cabal here.